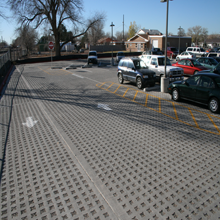 Grasscrete, a Bomanite Pervious Concrete System, is a cast-in place, monolithic, pervious concrete pavement that is continuously reinforced to provide superior structural integrity. The first application technique incorporates a reusable tool that creates the voids by having concrete placed in and around the tool formers prior to being pulled from the concrete slab. The second technique is using a single-use former that is placed on the sub grade with the concrete placed over the formers and the voids opened after the concrete hardens. The single-use formers are available in an ABS plastic former and the newly developed bio-degradable former, know as the Molded Pulp Former, that is made with post consumer recycled components. Grasscrete offers the ability to provide year-round access for a variety of applications requiring structural paving surfaces without compromising the aesthetics of the exterior landscaping. Grasscrete is a very sustainable product that can employ a large recycled material content both in the form of aggregate and binder such as fly ash or slag—its lifespan is indefinite and can be recycled itself to form the aggregates for future Grasscrete applications; providing Specifiers with a truly sustainable, eco-friendly system to accommodate a variety of needs. The benefit to Grasscrete for businesses and developers is that it drains at about the same rate as would an ordinary lawn in the same location. 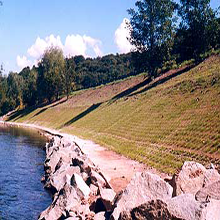 The presence of concrete has little effect on the drainage; the soil and the slope are the controlling factors which makes it beneficial for erosion control as well. Grasscrete is installed over a sub-base of gravel at a depth determined by the load bearing capacity required for the project. On site re-cycled fill materials are used in the sub-bases together with the use of topsoil in paving and retaining wall systems: as this is often available surplus from the excavation work it helps to avoid the unnecessary off-site disposal of waste materials. Grasscrete can also be installed over native soils saving money on excavation and gravel. 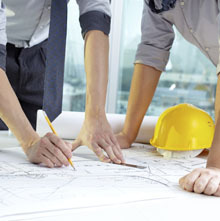 The subsurface all depends on the needs and the water runoff requirements, from thick beds of stone to water piping systems. 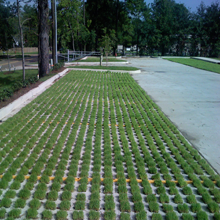 Grasscrete, as with many other “green” products generally costs 30% higher than traditional concrete pavement. 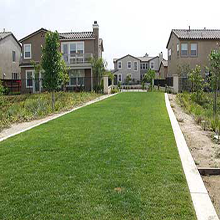 At times however, using Grasscrete can eliminate or minimize the need for storm water collection systems which may in turn lead to substantial savings. Contrary to convention, the structural advantages that Grasscrete offers over pre-cast can make significant savings in both the “construction” and “lifetime” costs of a project. Sub-base depths are reduced and curb edge restraints can often be eliminated. The construction process is much faster than for precast and the forms can be delivered by the truckload to cover 7200 sq m which is the equivalent to fifty truckloads of pre-cast. This is a serious statistic that saves both money and polluted transportation waste. SUDS, better known as “Sustainable Urban Drainage” is becoming an increasingly used term with planners and developers seeking to mitigate the implications of handling surface water run-off on the local storm water network. Pre-formed tank water management often involves the use of self-draining paving layers together with the installation of pre-formed sub-ground retention tanks, to store surface water for a controlled release into the drainage network. Grasscrete provides a more uniform percolation process that creates a more natural balance thereby reducing the risk of shrinkage in clay soils due to the urbanized modification of water tables. Some other benefits of the Bomanite Grasscrete System, include the improved reflectance of the crete as compared to blacktop, reducing the heat island effect. 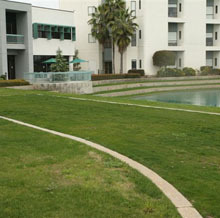 Grasscrete handles runoff and storm drainage via river training, slope protection and channels. It is also a sound product for retaining pond bottoms thanks to its pervious nature and helps provide a food source and cover for pond inhabitants.